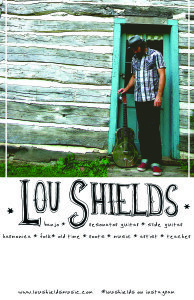 Lou Shields continues the tradition of American music with a solo-performance that pulls in styles of days-gone-by. Using his National Resonator Guitar or Banjo accompanied by a unique front porch style of foot percussion and harmonica, he uses his voice as an extension of the past. Lou carries a full sound during live performances while sharing stories, thoughts and experiences with the audience. Lou has played many festivals and shows across the country and has opened and headlined many shows – don’t miss this special event!